Meet Marisa: author, certified naturalist, seasoned trivia host, and procurer of art-friendly plant materials. Marisa has elevated the Museum by wearing many hats over the years, but we now know her as our Education Coordinator – a role she’s held since 2016. If you’ve enjoyed the Museum’s social media posts, then you’ve already seen Marisa’s handiwork at play. As the voice of our social media, she keeps our digital community abreast of the Museum’s many events, and helps others to forge connections with nature before they even walk through our doors. She also leads the Museum’s onsite school programs, coordinates group visits, helps orchestrate our public programs, and specializes in immersing our visitors in the culture and stewardship practices of the native people of Santa Cruz, the Amah Mutsun. Marisa first joined our team as a volunteer in 2013, shortly after earning her B.A. in creative writing from San Jose State University. She came to the Museum to learn the area, meet new people and conduct research for her writing. She soon discovered her passion for teaching others about the traditions of Santa Cruz’s native people when she became a docent. Today, Marisa is a certified naturalist under the University of California’s Naturalist Program. 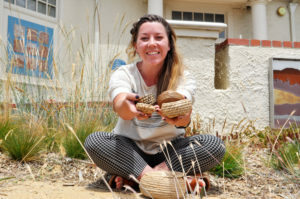 She helps to educate the Museum’s team of docents, and strives to help others learn and make use of traditional knowledge bestowed by native cultures of Santa Cruz. Her expertise extends beyond natural history, though, and well into the world of trivia. As occasional trivia host to Santa Cruz’s Red Room, 99 Bottles and the Museum over the past five years, Marisa has generated thousands of trivia questions spanning a variety of subjects. She’s especially fascinated by the connections people form with plants, be they for art, tool use or nourishment. Marisa aims to forge those connections through our many workshops, where visitors can get their hands dirty by extracting natural dyes, weaving baskets, or printing unique images of local algae, among other activities.